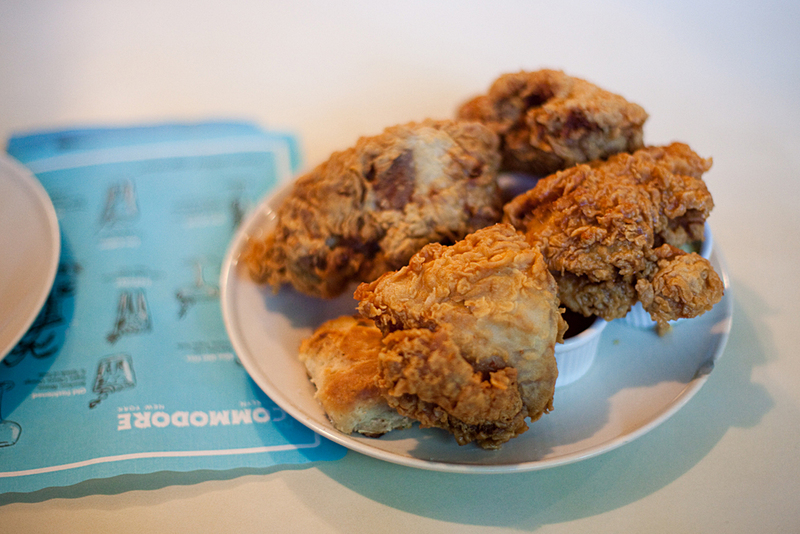 I can’t think of a better way to spend your summer than drinking and eating a plate of fried chicken. At The Commodore in Williamsburg, a divey bar with a little bit of retro-ness in it, you can get both and other delicious things. So go to The Commodore, order plates and plates of fried chicken (from the bartender), sit yourself down in the backyard patio area and sip some rum punch or frozen pina colada. 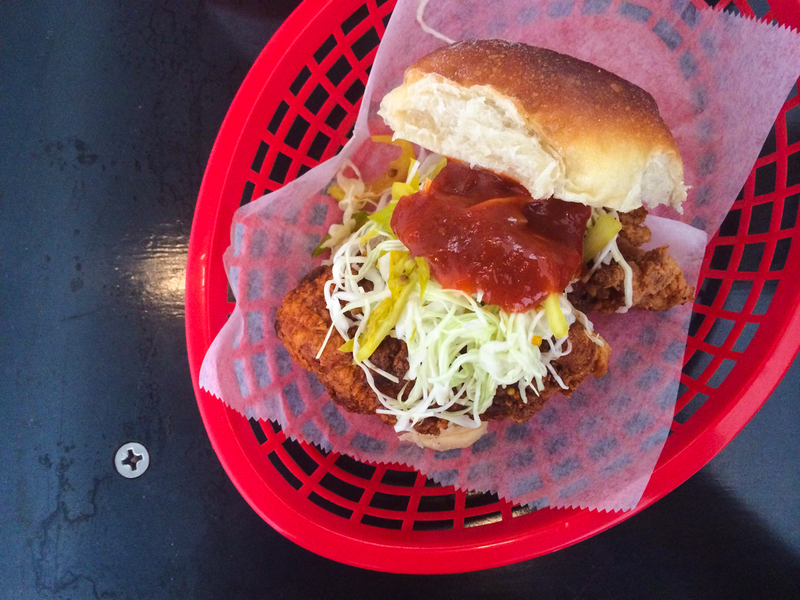 Recently Potlikker in Williamsburg started serving lunch on Thursdays and Fridays. I decided to check it out because 1) I love eating during lunch time more than dinner time 2) they have a fried chicken sandwich! The fried chicken was lightly breaded and fried and it came with a layer of goat cheese and hot pepper jelly ($12). This sandwich was simple, delicious and spicy. I’m usually not a fan of goat cheese but there was just enough for me to tolerate it and it did help cool down the spiciness of the hot pepper jelly. Also my lunch came with a bowl of curly fries. Curly fries will always be cooler than regular fries but waffle fries still trump all. Oh and a pint of Left Hand Milk Stout was a great way to wash everything down. This is usually what happens when I eat out with my friends. 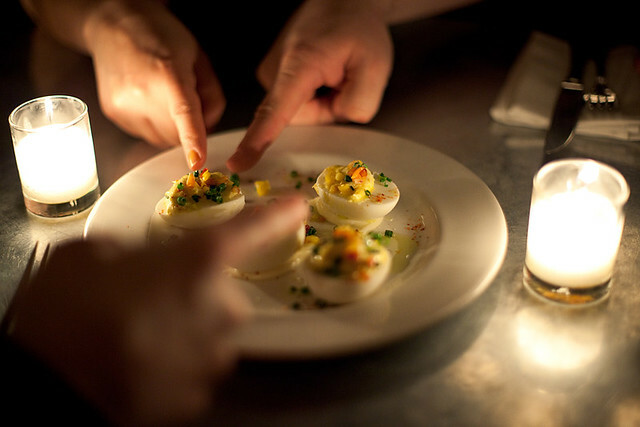 Fingers pointing at the food. And they usually like to keep pointing until I snap a photo. Sometimes we have a battle on which of us will give in first, like a staring contest. Last week we went to check out Reynards (and The Ides bar while we were waiting for out table) at the Wythe Hotel in Williamsburg. Being part of the Diner, Marlow and Sons…empire, the food was great and I may have had the most delicious Dark and Stormy ever. 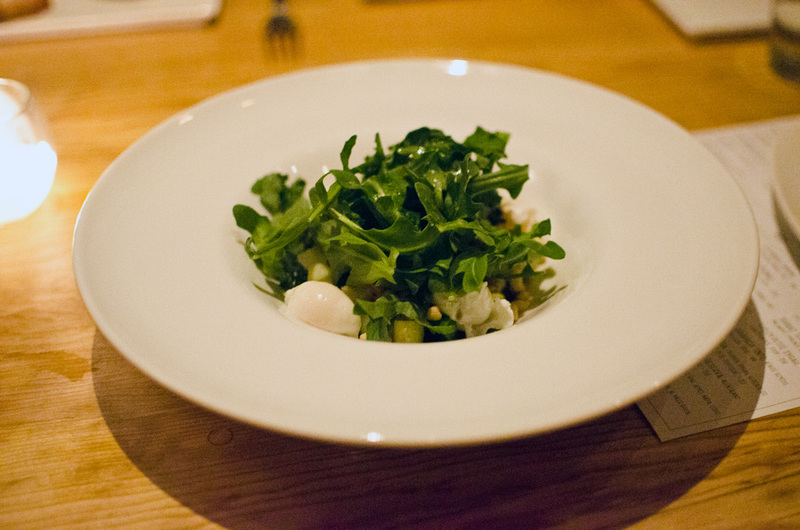 The night included pitchers of wine, perfectly cooked octopus and a comforting chicken dish. So today is Food Revolution Day! It’s the day where you take back your food from giant faceless corporations and cook it yourself. Yep, cook it yourself. Learn something new today. Learn about a new ingredient or a new method of cooking. If you’re an expert, go teach somebody something. Share your knowledge and information. Or go out and support the small mom and pop shop where they’re doing things the good and right way. 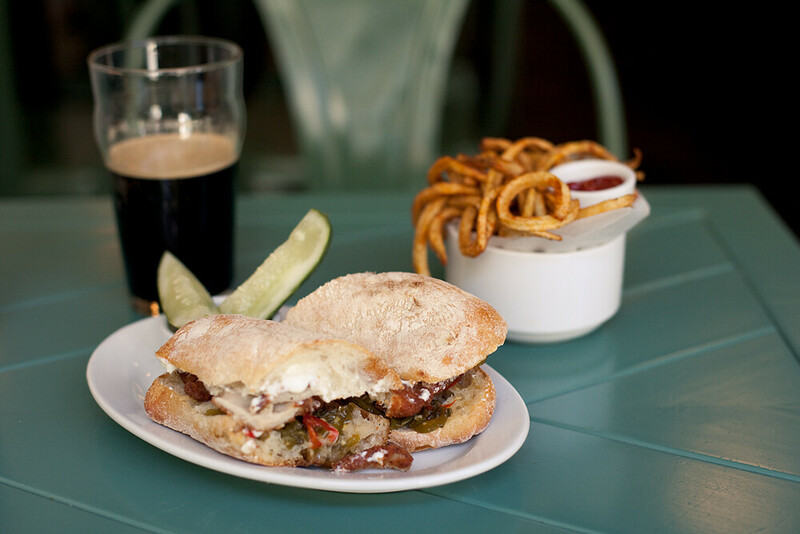 In honor of Food Revolution Day 2013, here’s a list of recipes that we like and hopefully you’ll like also! Guess what?! 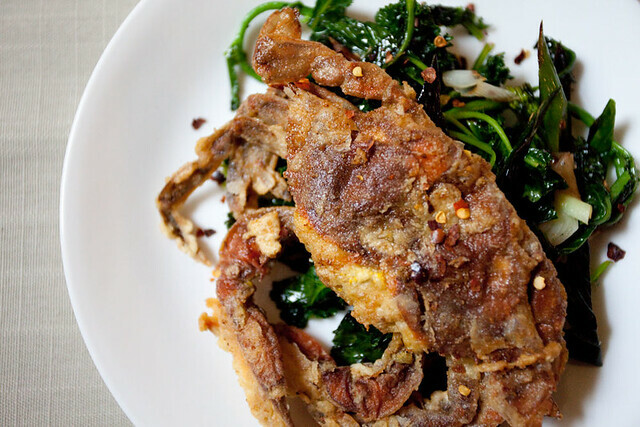 Perfect timing, it’s soft shell crab season. Go get some and cook this recipe. Thanks to Jamie Oliver, I’m in love with harissa. Also thanks to Jamie Oliver, I can now make flatbreads with my eyes closed. The lobster roll is like the perfect summer food, so here’s Howard’s vegan version. Here’s an easy tomato gratin. Speaking of tomato, here’s my quick and easy recipe for tomato and egg over rice. My mom’s chicken wings and potatoes with coconut milk is my MOST FAVORITE dish ever. Check out our video on making a 30 Second Vinaigrette. Cauliflower and apple make a great combination in this bread pudding recipe. Ah….here’s my Pad Thai sauce recipe plus few different ways to use it. If you find fiddlehead ferns at the greenmarket, buy some and try this recipe.